I cherish those precious moments in the day when I can lock myself in the bathroom and jump under a hot shower, pretending that the sound of the water blocks out all outside interference. Let’s face it, we all love our bathroom indulgences and I’m not talking about quilted loo roll. The one downside to indulging in this way, is the price. It’s tough times and I don’t know about you, but some of the first luxuries to hit the chopping block when I’m financially challenged are bathroom toiletries. 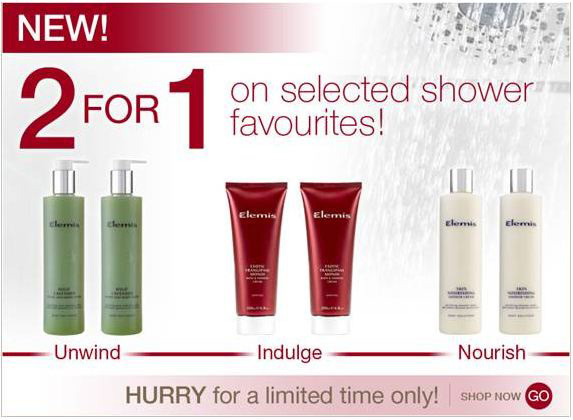 Get 2for1 on a selection of shower products, choosing from: Elemis Skin Nourishing Shower Cream Duo, Elemis Exotic Frangipani Shower Cream Duo or Wild Lavender Hand And Body Wash Duo. My money’s on the Frangipani… trust me, it smells divine. If you’re feeling particularly savvy, buy one for yourself and keep the other as a gift for someone special – it’s never too early to get those Christmas boxes in order. Unless you start on Boxing Day, ‘cos that would be kinda cuckoo. Do you have a favourite from the products on offer in this deal? I’m far too in love with my Original Source Vanilla and Raspberry to even consider anything else in the shower – I love starting the day smelling yummy. Exotic duo will be mine, gifts, pah! Thanks for this, think I’ll treat myself to the nourishing shower cream duo.